Cubemen 2 for iOS and MAS – Out now! Check out the new User Level gallery link above to see the amazing user levels being created! It’s TD like you’ve never seen or experienced before! It’s fast. It’s hard. It’s pure chaos, and it’s coming very soon to a computer near you. 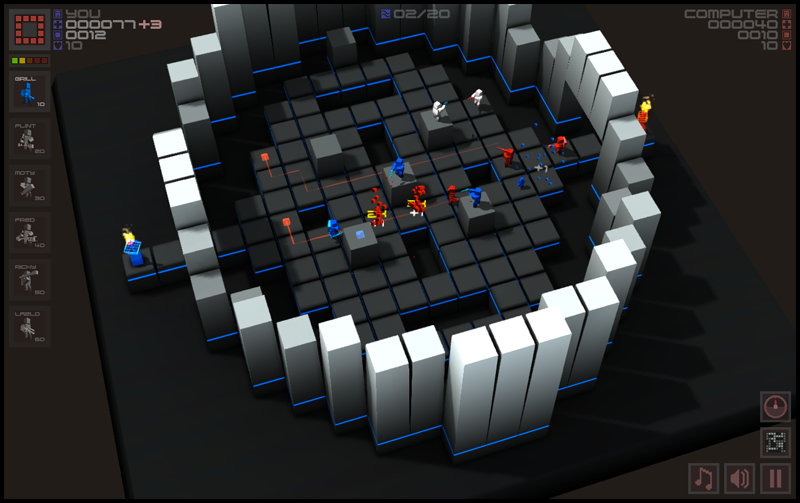 Cubemen is currently available on Steam (PC & MAC), Desura (PC & MAC), Mac App Store and iOS App Store (iPad2+ only). you can sign me up for the beta! 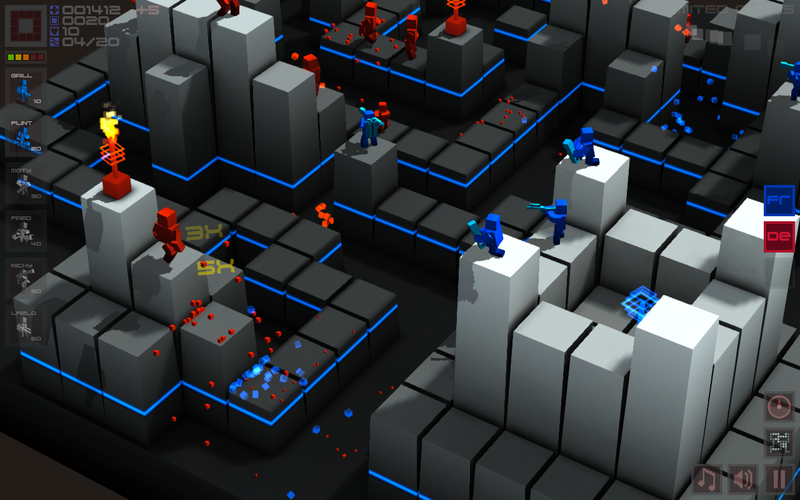 Alpha access is via Desura at the moment for Windows builds. OSX versions will be availabe once the 1.0 release version is ready. There will be a demo when it’s released but while it’s Alpha I wont be distributing a demo. Sorry Kevin, no demo’s at the moment. I have only had a couple of requests for demos. Everyone seems to feel $3.99 is cheap enough to not need one. LOL~~ looking at the pics… wondering… you got your ideas from Defense Grid? Since I only buys games on Steam, hope it will get released on Steam someday. If the price is right, I will definitely pick this up. but there just ain’t enough you know. do u have the darkness JACKY!!!!????? I don’t play any horror games…. or should I say… any games that increase my heart bit rate. Please tell me you’re planning on releasing the mac and windows build on Steam. I’d prefer to keep all my game purchases there, and not spread them out over Steam and the Mac App Store. hi guys, i have a question, if i buy it on Desura, can i add the cd key in steam later ? Thanks. iPad 2 and Retina version is on the way… stay tuned. Hi, is this Online multiplayer? Yes, Skirmish games are realtime, online multiplayer (one on one) action. Or you can play the same mode but against AI. It’s wicked fun! Does this game have coop? No co-op. Just single player or MP versus modes. Waiting for some actual reviews/feedback, it looks promising from the gameplay video on youtube. Are you going to continue develop and update the game after release? This is a really good game reminds me a lot of multiwinia charm. I just got it on the steam sale for PC, and while I like the gameplay, the camera angles seem kinda awkward and the games end up to me being the fire person spam because they seem the most cost efficient. My favorite maps are the skirmish ones with more than one angle of attack like the coliseum, it would be awesome to see more like that. And a map editor would be very nice to play vs friends. Also on the hill I my attacking soldiers got stuck, a timer to start the next wave after like a minute might work. Keep up the good work!! I played the Defenders of Ardania demo, which this game appears to be almost identical to. Fortunately that had a demo so I could see how restrictive, repetetive and limited it was compared to more advanced TD games like Defense Grid or Orcs Must Die. This game appears to be just more Ardania, limited tower placement, limited unit types, and a rudimentary rock-paper-scissors methodology. Endlessly firing out the same unit over and over and hoping to outclick your enemy isn’t strategy, and by restricting tower placement you effectively make every level only have one possible solution. Thanks, but no thanks. Will this run on a MacBook with Intel GMA950 integrated grahics? Thanks! No, we don’t support integrated GPU’s sorry. Work on GeForce 7300 gt ? Wait…you have to buy this from steam, but you can play it free on other websites? and you shouldn’t expect any either when you aren’t offering anything to the developer. Developing apps/games is a job…. not charity. The online version on Woglie.com is a cut down version. 5 maps out of 50 and doesn’t allow network play against the latest version on Steam, Desura and soon to be released iOS (iPad 2+) and Mac App Store. Consider it an early demo. The most important point of a demo is to see if it will actually run on a device: this “online version” can’t likely serve that purpose. key close the game by force or by task manager and open﻿ it again, please help me. All of the initial networking problems have been fixed in the 1.0.2 & 1.0.3 updates. Glad I got to see this thing come to life! Great work! I am going to try to buy this today. On my country the dollar is really, REALLY high, don’t know if it will be a good choice, will you release a demo? There will be a demo eventually. It’s been released right? Not beta anymore. Will this come out on Android? Possibly on the Kindle Fire in the futurte, but not other plans for Android at this time. I love the game! Keep up the good work! Cubemen has the same achievements on both platforms (Steam and Desura), but Desura don’t offer an API to integrate into to show achievements outside of Cubemen like Steam does. is this jsut a 2player multiplayer game? Do you mean by “iPad2+” the “new iPad” (aka 3rd gen) ? I mean iPad 2 and later so in this case the 3. The 3 is not faster in CPU that the 2, but much faster in GPU and has more memory, so definitely an improvement. This Game would be the perfect game to have a level editor in! I love it. Co-op would also be fun, or just more multiplayer components. This is a really amazing game! Keep up the good work. Too bad, it doesn’t run on a MacBook with Intel GMA950 integrated grahics. Are there any plans to support Linux in the future? I’d buy it again for that. Purchased this game yesterday and already I am in love with it. I would just like to go ahead and repeat a request someone else made. This really would expand the replay value if there was a level editor, or something built in to randomly generate maps. Also just purchased this for my roommate on Steam so we can now battle head to head. Love the concept! Love the game! also on iphone4-4s or only ipad? will there be one for ipod touch 4+ ? No, no iPhone or iPod support, sorry. Then i’ll give it a try! thanks. Can’t wait for this to hit iOS tonight. Just bought a new iPad and I’ve been waiting for this game!!! Very cool, Already loaded since find this game review from the ipadgamereviews.org !! Will release a version for iPhone? No, sorry, the screen is too small to allow for a good experience. will it work on ipad 1?? Why is it only for iPad 2? Because the iPad 1 is way too slow. Cubemen just doesn’t run well on it. Sorry. Wow great game, this and Oil Rush really redefine the TD Genre! Great game but one thing, the Name of your game is a little bit odd because searching in google for cubemen game or something is not really succesfull. 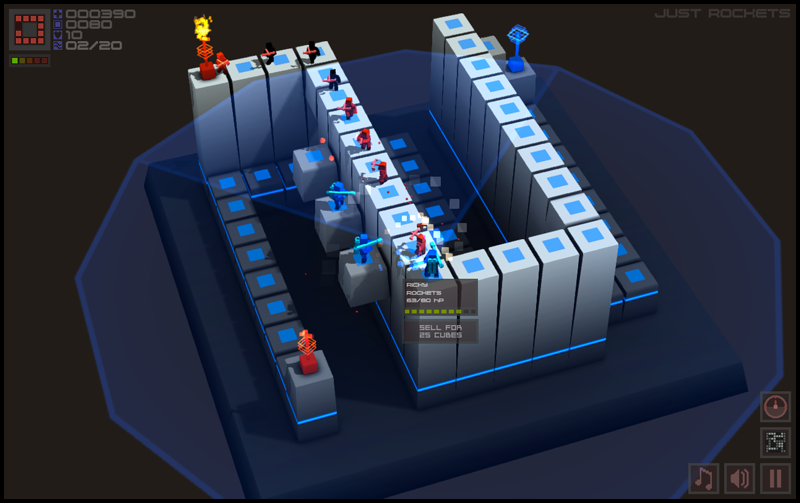 I was really impressed with Cubemen. It’s a great game! CAN U PLZ MAKE AND IPAD 1 version?!?!?!?!? Even if it’s slow?! ME AND MY FRIENDS WANNA BUY this game it looookkkkssss AWESOMEEEEE but can u make it for the iPad even if it’s slow? Can it run on Macbook early 2008 with intel GMA X3100 GPU?? Sounds like a really good game I wish they made it on I pod So I could play it !!! I got my new iPad tomorrow, is cubemen already supporting Retina Display? We only support Cubemen on iPad 2+, no iPhone and no iPod. Will it ever be for iPad or will it forever be iPad2? Only ever iPad 2 or higher. can mac app store buyers verse steam buyers? to bad there is no way to make your own levels, that would be fun. Will it be for Android soon? “that misex TD and RTS” – I believe you meant “mixes”? bought for iPad but will not automatically download for iMac–do you have to buy it twice? Of course, they are totally different stores. That is an Apple thing, not a developer thing. Apple might use the same login, but no apps/games on the two stores are linked when purchased. Sorry. Bought it for the iPad 3 but it will not automatically download for the iMac–why? DOes one have to buy it twice? This game is really fun to pass the time. Me and my sister kept playing for hours and hours because we always got the mortar guy first. For us he’s very useless in the start of the game. But when we get in the heat of battle, it’s a welcome addition to our game. The graphics are very simple i have to say, but are very detailed and nice. The different classes are very unique from anything i’ve seen before, I thought Mike was some guy with a very powerful weapon, But the I found out he was a Medic and that really paid off. Lazlo and Ricky are the ones me and my sister are trying to get first, As they are the most powerful in the heat of battle. This is very easy to play on an iPad 2 and very great indie title, I am hoping for more updates like more characters, a Map making system, and anything you guys can get your creative brains on to. No port forwarding or NAT translation required. Some corporate firewalls block UDP, but so long as you have a clear path to the internet, network games can be hosted and joined cross platform. and its not clear how to achieve high score. there would be no replayability. Very impatient with Indievania for the verison 1.1 update. Please could you make this for the iPad 1, you would get so much more money it doesn’t matter if you just make it compatible for the iPad 1 but please could you do something about this I really want to play this game on my iPad 1. It’s not about the money. The iPad1 is just not fast enough to run more than the basic few levels. Sorry. I am always looking at ways to improve performance, but how would you feel if you bought Cubemen for your iPad1 only to be told you can’t play 2/3 of the game? Not good hey? Yes you are right about that but at least you get something I mean who has the money to go out and buy like a 500$ dollar iPad 2 to just get this game I mean with our economy going down it’s hard enough to get jobs to earn that kinda money if you know what I mean but it’s fine thank you for your time and I’m sorry I bothered you thank you. I bought that game on steam and It works on Laptop I bought for $110 in convertation (I’m russian). A mini version of the game could be on Android and you guys could replace the buy the game button with donate button (Free game). Love the game. Keep working on it and maybe it will be little more advance. Why does it need a camera T—T I have first generation iPad this is rediculace why can’t it be for my iPad too. Because as I have written 100 times already, your iPad 1 is too slow to play Cubemen. Sorry. Some arhivements need to be fixed: bonus freezer, bonus destroyer & bonus healer – I got them when I picked up summary 20 FR/DE/HE bonuses, but description says that there are 50 bonuses picked up, also there are twin archivements – pick up freezer/destroyer/etc that rly work if you summary pick up 50 bonuses. Please have an update that allows for a co-op defense mode!!!!! I love the game so please keep up the good work! I wish for a mode were you can just crush them, you set up your units first, unlimited cubes to buy your cubemen and then you send in the waves, it would be cool , thanks! oh and I have spent 10 hours in one day so far, I finished every map in every mode and played 3 multiplayer mahems before wathching the Spain VS Italia match. Absolutely Spectacular game! it combines my favorite to types of games into one. I just bought this for me and my brother last night and we did a mayhem that lasted 58 waves. 22 of them were between the cpu and the rest were between me and him! Cant wait for the level editor and keep up the good work! I have installed the last update in IPad 2, and the application doesn’t work after the update. Are you aware of this problem ? Bought this thing on a whim, after i seen it was 2 bucks on the Steam shop. I have to admit. It’s really damn fun! I hope that this game gets really popular really fast! I picked up this game via steam and have to say that I really like it. The only thing bad I have to say right now is, I think the fact the ability to play a ‘skirmish’ is only via a random person is a bit of a let down. Wish there was a way to challange/invite a steam friend to a skirmish game. You can set up a password and tell it to him as I did so many times. should release on android market! Very very thanks for this wonderful game! I love it… This Game has what everybody wants: A friendly war simulation with custumize armys and funny effekts! And all 3D!!!!! Also, can you add diffrernt music/sounds for each mode/level? During couning points there should be esc key to skip it. Well, I bought the game on steam, for my mac. “Could not find steam client” EVERY time I launch it. I figured it was something to do with overloading steam server with the summer sale. I waited two weeks, same deal. The fix for windows was to run the game with administrator permissions, but I am already running it as an administrator. Is it just me? Hey, I’m gonna download this game in 2 days time, is it really fun to play? Some ideas to make the unit placement become more of a matter, and add some optional twist to map-makers in the future. HI, would you recommend the iPad or the Mac version for the best possible experience with the game. I understand that. Was just checking which is the version that the creator of the game believes better brings the game to life. i would reccomend the desktop version but it really depends on your desktop graphics and hardware. Is there a User Guide anywhere?